In Sweden, the social security and sickness insurance systems are comprehensive and aim to provide people whose illness prevents them from earning their own living, with either sickness benefits or disability pension. Some, however, are not entitled to these benefits or receive social insurance benefits at a level too low for subsistence, and are referred to social assistance. The purpose of this study was to explore in depth how social assistance recipients with chronic illness perceive and respond to the experience of living on social assistance. Seventeen in-depth interviews were carried out with chronically ill people who had received social assistance for several years. Grounded theory informed the design of the study. The study showed that different strategies (living one day at a time, taking steps forwards and backwards and making attempts to find ways out of the situation) were employed by social assistance recipients to maintain or improve their well-being. 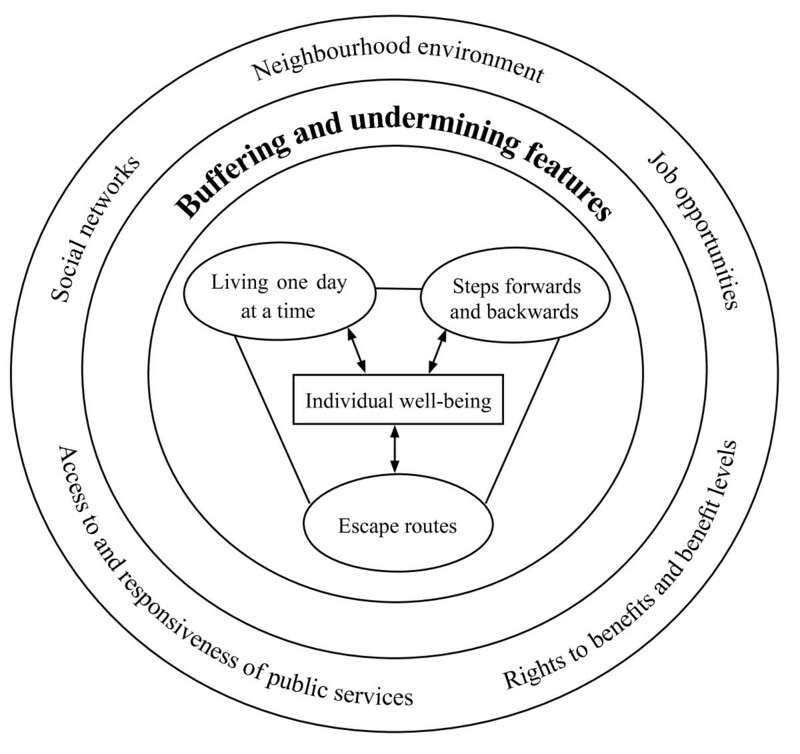 Contextual features like the prevailing welfare system, public services and the local neighbourhood could buffer or undermine these strategies and their overall well-being. These features together influenced how interviewees perceived their situation, the possible ways out of the situation and the consequences for their well-being. From this study it is evident that the way in which individuals on social assistance interact with services and how they are treated by professionals plays an important role in their well-being, in combination with what kind of help and support is available for recipients through the welfare system. In this respect, persons living on social assistance with chronic illness are particularly vulnerable. This study suggests that more effort should be made to find long term solutions concerning income support, rehabilitation and other services provided to this group. In our recent study among social assistance recipients , a substantial proportion reported chronic illness. People who are ill and seeking social assistance may be categorised in two groups: those who have a medical certificate showing that they are not able to work, but whose sickness insurance or disability pension is not sufficient or who are not entitled to other sickness benefits; and those whom social welfare professionals judge incapable of work at the moment because of social or medical reasons (for example drug or alcohol abuse, mental ill-health, neuropsychiatric problems or musculoskeletal pain). It is difficult to estimate the proportion of recipients of social assistance who are chronically ill. In their statistics, municipalities have different ways to code reasons for receiving social assistance and there are many different codes which are also health related (not all clients disclose that they have health problems). For instance, in a study in Stockholm 2007  37 percent of all adult recipients of social assistance were classified as being ill (including both mental and physical illnesses, and drug related ill-health). The experience of receiving social assistance may differ for individuals, and may vary depending on the reasons for not being able to support oneself. Some clients in society are considered as more deserving than others. Van Oorschot talks about "deservingness rank order in European welfare states", that people tend to support the provision of welfare for elderly and sick people and those with disabilities more strongly than welfare for unemployed people or immigrants . Recipients of social assistance are understood as the "least deserving" in this deservingness rank order. The set-up of a society, including social security systems and levels of benefits, and the views of the public on recipients of social assistance all colour the experience of being a social assistance recipient, which varies between societies [8–11]. In addition, the individual's own view of deserving or not deserving the assistance of society may influence their experience of living on social assistance. Besides having a limited income, living on social assistance may also have other meanings for recipients, for example loss of autonomy and being dependent on social services, feeling shame and not be part of the rest of the society [6, 9, 12, 13], which may affect health and well-being. In our previous study among social assistance recipients , chronic illness was a common feature, but we found few other studies concerning those who were chronically ill and receiving social assistance in Sweden, and how this was perceived by the recipients themselves. From a public health and policy perspective it is important to study this group, as they are disadvantaged not only in terms of having a chronic illness, but also in terms of being dependent on social assistance for their subsistence which may further exacerbate their ill health and contribute to social exclusion. The purpose of this study was to explore in depth how social assistance recipients with chronic illness perceive and respond to the experience of living on social assistance. The study reported here is part of a larger study in Stockholm aiming to study experiences of living on social assistance in Sweden [6, 15], and also a part of a comparative project between Britain and Sweden, which aimed to identify and compare the influence of policies and services on resilience in poor households. This comparative project was one component of the ESRC Human Capability and Resilience Network, concentrating on resilience in the face of socio-economic disadvantage and poverty . In our previous study among 33 social assistance recipients , two overarching themes emerged: material and psychosocial dimensions of living on social assistance. Interviewees' explanations of what led them to claim social assistance were also described. Seventeen of the 33 interviewees stated that they had had work incapacity due to illness or disability for more than one year. Therefore, we decided to investigate further how these interviewees perceived their current situation when living on social assistance. Usually the concept of illness refers to the subjective response to feeling unwell . In this study we rely on self-reports of interviewees. The guiding methodological approach was grounded theory . Grounded theory was regarded as suitable as the study was explorative and aimed to investigate the perceptions of living on social assistance and social processes shaping these perceptions. We conducted fieldwork in six sites in Stockholm County, providing a variety of geographical settings with differing socioeconomic compositions. According to the Regional Ethical Review Board in Stockholm, section 5, the study did not require ethical approval under local guidelines (dnr 04-609/5). We employed a purposive sampling strategy [19, 20], which generates a sample suited to the specific needs of the study and the research questions. We did not decide in advance the number of interviewees or the type of categories they would represent; the number was determined during the sampling and initial analysis of the data. Our primary purpose was to explore experiences of people living on social assistance. The secondary purpose was to gather data from people with potentially different experiences (both positive and negative) to enable to contrast their experiences of living on social assistance. The inclusion criteria for sample selection were that a participant should be of working age (between 18 and 64 years), currently receiving social assistance as their main source of income or as a supplement to their other incomes and willing to be interviewed. We aimed to recruit a heterogeneous sample of social assistance recipients comprising both men and women in different ages, including for example long-term unemployed people, lone mothers, and immigrants to Sweden. All these groups are common among social assistance recipients in Sweden [2, 3, 10]. To recruit interviewees, we first contacted units working with social assistance in each of the study sites and came into contact with some of those interviewed through social workers. We then contacted other places to which social assistance recipients were often referred, including several centres for labour market activities for people receiving social assistance. Most of the individuals asked to participate agreed. Three of those who were recruited did not attend arranged interviews for different reasons. Several interviewees did not attend the first time we had booked our interview. We arranged a new time and in some cases a third time. Hence, the recruitment was time consuming. We ended the data collection when we felt the "saturation point" was reached, that more interviews would add so little information that it would not be meaningful to conduct further interviews . The first author (AM) conducted 33 in-depth interviews. The length of the interviews varied from 40 minutes to two and a half hours. Most interviews were carried out in Swedish, but one in Finnish and one in English. A further three interviews were conducted with the aid of an Arabic speaking interpreter, when the interviewees felt they could not express themselves properly using Swedish. Before the interview, the aim of the study was explained to the interviewees, who were informed of their right to withdraw and that responses would be kept anonymous. An interview guide was used including open-ended questions about the daily life of interviewees, their contacts with services in the community, what made them feel well and what bothered them most, and how they managed their finances. Interviewees were also asked to reflect on how they felt about their health and the future. The interviews took place at social welfare offices, at the local public library or in activity centres to which social assistance recipients were referred. Interviews were tape recorded with permission, and were conducted in 2005-06. The present analysis focuses on how those 17 interviewees who reported having chronic illness perceived their current life situation when living on social assistance. They were selected for this analysis and are the subjects of this paper. Demographic characteristics of the interviewees are presented in Table 1. Twelve of them had children. All 17 interviewees reported that they had an illness which had lasted for more than a year. Interviewees were a heterogeneous group of people concerning their ill health and troubles they had with their illness. Both physical and mental illnesses were reported (e g epilepsy, heart disease, musculoskeletal pain, depression, anxiety and panic attacks) as well as drug/alcohol related health problems. Some interviewees had experienced times in their lives when they could not even get out of bed and manage daily routines like shopping and cooking. Some interviewees had quit taking drugs and alcohol and suffered from health problems related to that. Some had mental health problems, e g depression and panics attacks, and were in the middle of the recovery process to manage their daily lives with their illness. Fourteen interviewees had social assistance as their main source of income. Ten interviewees had lived on social assistance for more than five years; four interviewees reported that they had received social assistance from time to time over several years. At the time of the interview three of the interviewees had disability pension, at a level insufficient for their subsistence, which meant that they could qualify for social assistance as a supplement to their pension. In such a case social welfare offices did not make specific demands on them. Some of the interviewees said they participated in labour market activity, several that they were waiting for an examination of their work capacity, and some said they were not participating in any such activity at the moment because of their health condition. All interviews were transcribed verbatim and were analysed initially with open coding, whereby the researcher assigns codes to pieces of text, going through each transcript, line by line . The paradigm model was a guiding principle in axial coding where data is put back together in new ways by making connections between categories and subcategories . For example, we identified interviewees' strategies to manage their daily life as an emerging category. In the final stages of the analysis the core category of the study was developed and selected (selective coding) and through this we made sense of the relationships between categories and subcategories developed during the analysis. The Atlas.ti 5.6.2 software (Scientific Software Development, Berlin) aided this process. Data analysis followed the constant comparative method [18, 21] through ongoing comparisons of categories from one case to the next (for example experiences, situations, actions), within a case and comparing incidents with incidents. All the authors were involved in discussions about emerging categories and the analysis of the data. The names of interviewees in the accounts in the results-section have been changed to protect interviewees' anonymity. Quotations were selected to illustrate the issues that emerged from the data. The findings fell into four main categories. Three categories concerned how interviewees responded to their daily life. Different strategies (living one day at a time, taking steps forwards and backwards and making attempts to find ways out of the situation) were identified in the accounts as ways that the individuals managed the situation and maintained or improved well-being. The fourth category was labelled as the core category of the study and identified those features found to buffer or undermine interviewees' well-being. The categories found in the analysis were seldom conscious choices or something the interviewees planned, but we could identify them in the accounts they gave. The identified categories often occurred simultaneously, and were not mutually exclusive. How interviewees perceived their situation depended also on other circumstances (e.g. experiences of labour market practice, family members' health situation) during the period being ill and living on social assistance. Figure 1 was constructed to illustrate the conceptual model emerging from the data about influencing features and how they interact. Conceptual model of buffering and undermining features influencing well-being. At the centre of the model is the individual well-being for social assistance recipients who are chronically ill. The three categories immediately surrounding that (living one day at a time; steps forwards and backwards; escape routes) all influence well-being and interact with one another. Contextual features like the welfare system including rights to benefits and benefit levels, access to and responsiveness of services as well as social relations and networks could buffer or undermine individuals' strategies and their well-being as a whole. At the centre of the model is the individual well-being for social assistance recipients who are chronically ill. The three categories immediately surrounding that all influence well-being and interact with one another. The interviewees had a short time perspective in their lives. They did not plan the future because the future was so uncertain and they perceived their opportunities to influence it as limited. Living one day at a time or "today" was their way to lessen the stress over the economic, health-related and social situation. In this sense the short time perspective acted as a buffer in this situation. At the same time living this day was also undermining as they had no opportunity to make plans for the next week or month, or the future. The process of improving health or life situation included both steps forwards and backwards for most of the interviewees. For some the change to better health or social situation was rapid but for most it took time. Different small steps forwards, such as managing daily routines like shopping and cooking, were often necessary for major transitions like finding a job. In the accounts we also identified interviewees' conscious or unconscious attempts to find "escape routes", ways out of the uncertain situation. Getting other benefits, like sickness benefit or getting a diagnosis were identified as such. Contextual features like the prevailing welfare system including rights to benefits and benefit levels, access to and responsiveness of services as well as social relations and networks could buffer or undermine individuals' strategies and their well-being as a whole. These features were interwoven in interviewees' accounts. The core category of the study is called "buffering and undermining features to well-being". These features were discussed directly in interviews or indirectly through talk about meeting professionals and being in contact with the welfare system. In Table 2 examples are given of these features which we have categorized at individual, neighbourhood, service and socio-political level, and which shaped the context in which interviewees perceived their situation when they lived on social assistance and had a chronic illness. For me it is to feel safe, have a balance somehow in life between difficult things and good things. Right now I don't have that balance. But if you can find that feeling, which I think is possible, then you have an inner peace. And that, I think, is what you should have. I don't feel that I am a piece of paper among other papers on their desk and that feels good. When they treat you as an individual, it is also easier to talk about my situation...And then it becomes easier for social services to understand which kind of needs I have. Their role as I see it, is to push us back to society...sometimes it takes a short time and sometimes a longer time. It depends; we all have different things to deal with. Access to nature and leisure time recreation were other examples of important buffering features especially in the situation with limited economic resources. On the other hand, where there were family problems or destructive relations; where access to services was poor or services were perceived as non-supportive; or where the immediate environment was poor, these features acted to undermine the well-being of individuals. One example of these undermining features was when the contacts with authorities made interviewees feel worse. As social assistance recipients they had to act as they were told; otherwise they did not get their benefits. They had to answer to a lot of questions about their private life. Some interviewees described they felt "as a little child" when being in contact with social welfare. At the socio-political level, the accounts referred to the context in which social and health services were implemented and to which rights, benefits and social and health services interviewees had access. Features such as rights and access to child care and welfare benefits, provided the basic opportunities for welfare and prerequisites to build on in the process of change. Most interviewees, especially those with an immigrant background, were worried about their own possibilities to find a job and earn a living, but were happy for the opportunities their children had in society. Ali, a 53 year old man with an eye-disease waiting for an operation had lived in Sweden for six years, and reported that all his four children had learned Swedish quickly through the day care and school. The oldest ones wanted to study medicine and social sciences at the university. Although they lived in such an insecure economic situation, Ali perceived that his children had opportunities for education and "a better life". He said: "The future is theirs, not mine..."
In the following section we present the three categories of strategies identified in the accounts as ways that individuals managed their situation and maintained or improved well-being. We found the category, "live life one day at a time", as a response to difficult circumstances; not thinking too much about the future and problems in life. To live on social assistance was in itself a strain; being ill at the same time increased the vulnerability. A way to lessen the stress over the economic, social and health situation was to live "today". This category includes two subcategories (uncertainty and shame with social assistance and between hope and despair). P: This life I live now, I don't want to have it. This is a total disaster. I: What in your life is a disaster? P: I like to work, have something to do. But when I have this pain, it doesn't work. There are no options; I do labour market practice now, but for how long? Who knows? One month perhaps? The majority of the interviewees did not qualify for sickness benefit. Social assistance provided them with the opportunity to get by during the time they were sick and not able to work. However, they had to renew their application for social assistance each month and go through the same appraisal procedure over and over again. To apply for money every month was perceived negatively by most, especially when they were ill and health improvement was their primary objective. It was very embarrassing. They have to come and see. They asked a lot of questions, how long I had that Hoover and so on. But I don't ask for a Hoover from social welfare if I don't need that. It really was a last way out for me. I asked my family, my relatives if they had any. They didn't have, otherwise I would never have asked social welfare. I really want to work and provide for my family. But sometimes I think it is too late, I am too old...I am like half a person [with his health problems] but still I am trying. I don't dare to plan any future. Anything can happen on the way. So I take a day at a time. I don't even plan next weekend. I am not that kind of person who is planning because you never know. Hopefully it is going to get better some day. That is my goal. To find a job and get somewhere. The category "two steps forwards, one step backwards", illuminates the process of being ill when living on social assistance, and trying to find solutions related to social, material and health issues. Sometimes the process consists of many steps forwards, but often also some steps backwards and then some forwards again. This category includes two subcategories (the process of change, and finding meaning in life or giving up). In interviewees' accounts, improvements in health or life situation came about through a process of small changes in daily routine so as to manage activities in everyday life like doing shopping, being able to go out for a walk, meeting a friend or getting help with something in daily routines. Some interviewees had also participated in labour market activities which in some cases the participants had perceived as not helping them that much. In other cases the impact of the labour market activities was the opposite, they felt stronger after participating. For example Lisa, a 25 year old woman who suffered from panic attacks said that activities had helped her "to grow" and "to feel safer". I really did not manage all that, mentally or physically. I think after the rehabilitation program it would have been better if I had been on sick leave a couple of months because I was not ready. The point of the program is to reflect on things. I had awful pain all the time and at the same time a thousand things on my mind. I felt I was going crazy. I was so tired. One morning I woke up and I did not manage anymore. Different small steps preceded major transitions like attempts to find a job or get a diagnosis of the health problem or get another source of income. Four subcategories could be identified influencing these steps forwards: finding meaning in life despite difficult circumstances; enjoy small things in everyday life like being able to go out and take a walk; children and social contacts giving joy (interaction with others); or interests giving joy. My daughter is very important for me. I will see her growing older and all stuff with the family and so on. I want to see her happy and have a good life and if I can I want to help her as much as possible. Several interviewees who had adult children had assistance from them, both in social and material aspects. For example Leyla, a 42 year old divorced woman who had problems with restless legs and back pain, described how her son helped her every month to pay part of her rent because the social welfare office did not pay the whole amount (her flat was considered too big and expensive for her). Hossein, a 55 year old divorced man with disability pension, described how his son helped him with all kinds of daily routines like taking a shower and shopping food (he was not able to manage these things by himself because of his ill-health). If I had felt well, I never would have ended up bankrupt. In that situation I had no strength to struggle. My daughter was taking drugs all the time and it was constantly something going on, problems in school. This had been going on for a longer time and I was ignoring difficulties with my income because I had no strength. We had no structure at all in our life at that time. I have so many problems with my money... When your income is limited, your life is limited...I am not able to see forward, I don't see any future...When you don't have any money, then the pain comes...If I don't have a good income, I can't have good health. Three "escape routes" were identified (job or labour market practice, having a good relationship with a professional and getting a diagnosis or other benefits). ...I have gone through so much; I am not able to seek a job. I can't get a permanent job because I am going to screw it up anyway. I have the strength to fight for two weeks and then I get tired. I have had so much trouble with things, private things, drug abuse [in her family] and this and that. Most important is that you have a good contact, that you have trust in that person...I am glad that I got this girl [social worker], I have. She really has done more for me than she has to do. She really has helped me. Annica, a 47-year old divorced woman with musculoskeletal pain, a mother of three children was waiting to do a work capacity appraisal. She got her income from social assistance instead of sickness benefit although she could not work because of her pain. She was not happy that social welfare professionals sent her to different activities which she felt were not suitable for her, with her health problems. She believed that if she got sickness benefit, they would probably have more understanding for her health situation. As social assistance recipients, the interviewees did not automatically have access to rehabilitation. This depended on a range of factors, including the kind of health problem they were suffering from, in which municipality they lived and which professional they met. All the time, I ran back and forth, back and forth between them. If I was not actively seeking jobs I didn't get any money. That is why some months I didn't get any money at all. And I had no energy to fight with them either...I suffered from panic attacks; I couldn't manage to take a bus or train because of that...and they said: seek jobs everywhere...It was impossible. Although the social security and sickness insurance systems are comprehensive in Sweden and aim to provide resources for people whose illness prevents them from earning their own living, there are people who are not entitled to these benefits and are referred to social assistance. This study illustrates the hardships associated with being chronically ill and living on social assistance in Sweden, and strategies employed by the individuals to manage the situation and maintain or improve their well-being. Furthermore, it describes how the interaction between individual and contextual features may buffer or undermine well-being. Living on social assistance is a strain, especially in the longer term, both for the individual and his/her family, and may also lead to social exclusion [13, 14]. Social assistance clients in Sweden, including those with chronic illness and unable to work, have to renew their application for social assistance each month and go through the same appraisal procedure over and over again. Although not intended as such, for some individuals and groups social assistance has become a more or less permanent solution for their subsistence problems. Some interviewees indicated that they would prefer to have their income from social insurance, even if it were at a low level. With such an arrangement, at least there would not be the economic uncertainty associated with social assistance. Instead of income security, social assistance had become a source of permanent insecurity in their lives. This contributed further to worse health and well-being, as also indicated in other studies [7, 9]. Arguably, chronically ill persons on social assistance have the same kind of needs for rehabilitation as those chronically ill persons who qualify for sickness benefit [22, 23]. Several interviewees (for example those whose health problems started before they came to Sweden and those who had not yet entered the labour market) were not covered by services organised by the social insurance office and their possibilities for rehabilitation were limited. In such cases access to rehabilitation depended on the municipality in which interviewees lived, what kind of health problem they suffered from and which professional they met. Lack of rehabilitation and sometimes even lack of a diagnosis were hindering interviewees in the recovery process. Some interviewees, particularly those who had diffuse or undiagnosed health problems, perceived a lack of coordination between the different authorities involved. This is in line with findings of other investigations in Sweden [7, 22], and suggests that other approaches need to be considered in order to meet the needs of chronically ill persons who do not qualify for the regular services. Some interviewees expressed the view that it is "not their fault" that they had to rely on social assistance; in case of illness society should help and give support. As sick or disabled they saw themselves as "deserving"  which lessens the stigma associated with social assistance. In an earlier study Gunnarsson  found that younger and older women gave social assistance different meanings: for the younger social assistance was a way to be economically independent from their parents. The older ones, who in several cases were also ill, perceived social assistance as economic dependency and saw that finding a job or getting sickness benefit would be the solution. In our study, social assistance was not perceived in the long run as a route to independence, but as a source of dependency and insecurity, even among the younger. Social assistance still today is associated with guilt , shame and feeling stigmatised [9, 10, 12, 14]. Several interviewees in this study as well as in our earlier study among social assistance recipients in Sweden  did not want to identify themselves as one of "those" who receive social assistance, but explained their situation as caused by external factors outside their reach, as poor health, family problems, poor labour market or discrimination. Interviewees had contacts both with health care and social services, and were dependent on professionals and welfare benefits for their living. Services and professionals could be buffering or undermining depending on what kind of help and support interviewees were referred to or how interviewees perceived they were treated. There were several examples of how professionals and services had facilitated a positive change in the interviewees' lives. They felt they had been treated with respect and as individuals, without being judged. There were also examples of the opposite, when services and professionals "made things worse". Different professionals may also have qualitatively different views on clients, leading to "unequal encounters" and differences in opportunities for rehabilitation . It is important that services and professionals especially consider the needs of individuals with chronic illness who depend on social assistance for their subsistence, as they may be in a particularly vulnerable and dependent position in relation to public services. In an earlier study of ours  carried out in Britain among people living in poor households, positive changes in interviewees' lives depended on opportunities arising for them to release their potential in order to start further processes. The achievements in everyday life like being able to get children to school on time were examples of an "upwards moving spiral", small steps toward something more positive. In the present study, accounts also illustrated that the process of improving health or life situation included both steps forwards and backwards. Taking "too big steps" too quickly could result in regression and losing self-esteem. Finding work or labour market practice was also found as an "escape route". The "dream" or desire was to "find work and get somewhere". However, most of the interviewees in this study were sceptical about finding and managing full-time job, with their health problems and having been outside the labour market for several years. A gradual and stepwise entry or comeback into the labour market would therefore be more realistic for many in this group. The findings of this study suggest that health and social welfare professionals should focus on finding individually adapted solutions for their clients, as well as building trust and understanding about the strategies individuals use in adverse circumstances to maintain or improve their well-being. From a health and social policy perspective the links between ill health and social disadvantage should be recognised, and coordination between health and social services for this group needs to be improved. There is also a need to further develop ways of entering the labour market for social assistance clients with chronic illness. The maintenance of good quality in local health and social services benefits the population as whole, but especially the most vulnerable groups who depend on services for their living. Social assistance clients with chronic illness are a vulnerable group who risk "falling between the stools" in their contacts with health care providers and other welfare institutions. This study was explorative and its results cannot be generalised. Nevertheless it has highlighted some experiences, strategies and needs of a particularly disadvantaged group in the Swedish society. In this study we did not present comparisons between interviewees living on social assistance with or without chronic illness. However, several categories (e.g. living one day at a time or having a good relationship with a professional) were found to be important among both groups in our data. Follow up studies of persons with and without chronic illness living on social assistance might shed further light on the development over time of these groups. Ethnic background was not a specific focus in this study but will be addressed in a coming study. Chronically ill persons living on social assistance face many adversities. How they perceive and respond to the experience of living on social assistance is coloured by different features at individual, neighbourhood, service and socio-political levels. Contextual features, including the way in which individuals interact with services, how they are treated by professionals and what kind of help and support is available through the welfare system, are crucial in this adverse situation. Policy making and public services should especially consider the needs of chronically ill persons living on social assistance, who may be particularly vulnerable to a further decline in their health and to social exclusion if they are in this situation for a prolonged period of time. We would like to thank the people who participated in this study. The research was funded by Stockholm County Council and the Economic and Social Research Council (ESRC) under grant No. L326253061 for the study of how social welfare policies and practices build or undermine resilience in poor households in Britain and Sweden. The study is part of the multi-project ESRC Priority Network on Human Capability and Resilience http://www.ucl.ac.uk/capabilityandresilience. The ESRC bears no responsibility for the analyses or interpretations presented here. The funding organisations had no role in the study design, data collection, analysis, interpretation or writing this article. The authors declare that they have no competing interests. AM participated in the design of the study, carried out the interviews, analysed the data and drafted the manuscript. EJ participated in the analysis of the data and preparing the manuscript. MW participated in the design of the study, in the analysis and preparing the manuscript. BB participated in the design of the study, in the analysis and preparing the manuscript. All authors had read, revised and approved the final version.